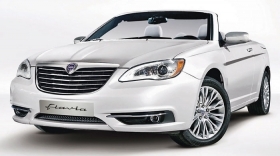 The Chrysler 200 convertible as a Lancia: Fiat is betting that lack of a diesel option won't be a problem. TURIN -- Fiat displayed both the Chrysler 200 sedan and convertible at the Geneva auto show in March, hinting each would be sold in Europe badged as Lancia Flavia models. Now Fiat sources say only the convertible will come to Europe. Insiders say the cost of adding a diesel engine killed the business case for the 200 sedan in Europe. Diesels account for about half of European passenger-vehicle sales. Fiat executives decided to stick with the plan to offer the convertible early next year as the Lancia Flavia cabriolet. They're betting the cabriolet variant is attractive enough to withstand the lack of a diesel variant.